Mixology in simple words is the art of preparing mixed drinks. The drinks prepared as a result of employing this technique might be alcoholic as well as non alcoholic. Finely mixed drinks always leave an impression. While even the best variant of your favorite drink might end as a short-term memory, the mystery behind the unusual punch that took you by surprise in the late night party will linger on your taste buds till the morning after. Be it martini, tequila or whiskey, a different mixture of the components each time is what adds the variety to your life. Mixology is also a good career prospect as they are and will always be fewer in number than bartenders. Social Elite Staffing describes the ratio of bartenders to guests as 1:100 for parties and 1:75 for weddings. Imagine, if in a party with a crowd of more than thousand guests, there is only one mixologist, how much special and demanded he’s gonna be. Most people who have tried to unwrap the basics behind making a cocktail would know that the basic components of a cocktail are the base, the modifying agent and flavors and colors. But what after that? Do you all know the various categories of mixes and cocktails, what is the basic differentiating factor between a Daiquiri and Jack Rose? In today’s party-crazy world, having a good knowledge of mixology can help you a great deal as the person who can take control of the party can take control of a lot of things, and drinks are the trump card. Mixologists, with more extensive and in-depth training than bartenders, know the most unique things about drink recipes, sour drinks, non alcoholic drinks and a lot more, and can use this knowledge to the best of their advantage. The art of mixing is one art anyone and everyone who has a taste for fine drinking would love to possess. As suggested in David A. Embury’s classic cocktail book The Fine Art of Mixing Drinks, some of the basics that need to be ensured for a quality cocktail are that the quality of liquor should be absolutely top-class, not containing heavy agents. It should also have a good appearance and aroma. Mixologists would know how to use substituting agents and how small additions can modify the taste and the overall effect of the drink. Icing is another important aspect that will be covered in all mixology courses around the world, because, as you know, people have different preferences for temperatures. Some of the popular schools and universities that are imparting education and professional courses on mixology are The Columbia School of Mixology, University of Mixology (California), Mixology Group (UK), Professional Bartending Schools of America (all over America) and Universalclass.com (Online class). Myles Cunliffe, the director of Mixology Group says "Once you've completed our course, we believe that we've provided you the knowledge and confidence to go out and get a higher profile job. Meaning you can enjoy work more, get better pay and have more time off." 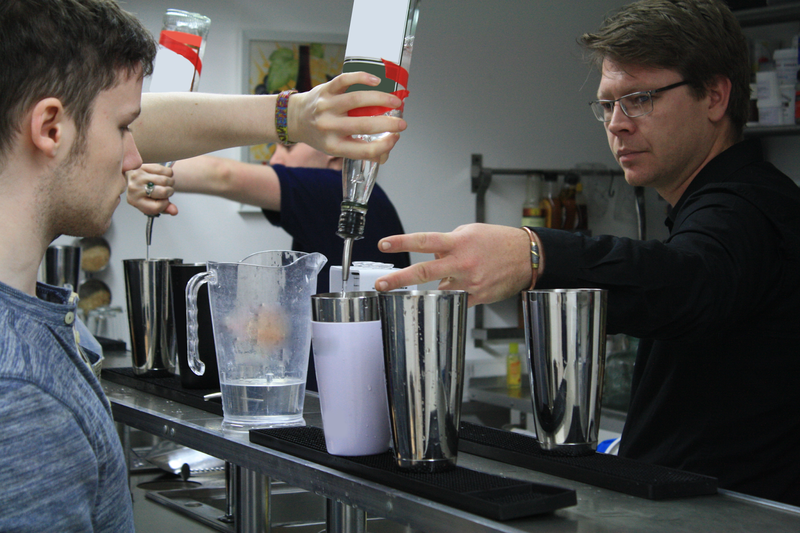 Myles Cunliffe, Director, Mixology Group, teaching a few tricks of the trade to prospective mixologists. While studying mixology from these universities, you would learn it from expert, experienced mixologists and bartending experts who have traveled all around the world; with hands on practical teaching, allowing you to make the mistakes. You can also try online classes, which are imparted through videos or video conferencing. While each school or university has a different course curriculum, the major aspects that will be covered in most mixology-based bartending course would include drink recipes, garnishes, basics of and around the bar, pricing, serving techniques, substitutes, inventory management and of course, the liquor laws. Whichever school you learn from, make sure your mind is always open to new ideas, from within and from others. Wisdom is one of the key drivers of smartness, and one who is wise can lead the way. A good knowledge of the various mixtures can help you impress friends, win over dates, win competitions and land a job, or if lucky, a business opportunity. The scope of learning and winning in the field of mixology is infinite, it’s just up to you how you tap your potential. So why not give this option a try?